THIS PRODUCT HAVE BEEN MADE AVAILABLE AS PER NEEDS ON A FEW OF MY FELLOW FPV GOERS, THE BATTERIES USE PANASONIC NCR18650B WHICH AS PER THE MANUFACTURER ARE RATED AT 3400 mAh. The final batteries will have a full heatshrink cover looking different thatn the ones on the pictures, but beside of the internal teflon tape to isolate different sells. they will be identicall "Exept for the number of P or number of individual batteries per sell. 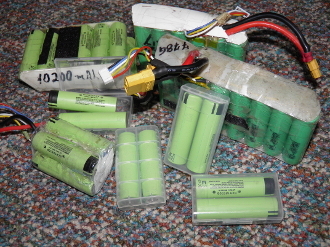 Obviously, this is sale is only for one 9P, 4S- 16.8 V battery, fully asembled "No Connector" you can request the connector and there is and extra custom charge for the shipping, due to federal regulations of high power batteries in the mail... so it is adviced that you contact us and request a full price for each battery. We have avalable 6P up to 16P, prices will be given upon request.